I rec'd a voicemail last night from a long-dead victim of a serial killer. Now, granted, the call was made from Alabama, but me, being the kind of person who overthinks things, began to assume that it was some sort of message... from the OTHER SIDE! I was lying on my couch, taking a nap, and having a slightly weird, sleeping-when-I-don't-normally-sleep, nightmare-type dream when I was awakened by the sound of my computer voicemail picking up. I sat up, leaned over the laptop as I wiped my eyes, and tapped the touchpad to reactivate the screen. I looked at the name... It looked familiar, but I couldn't place it. At first, in my semi-conscious, just-woke-up-from-a-nightmare state, my mind went to authors of horror stories, like Frankenstein. Then, it hit me. 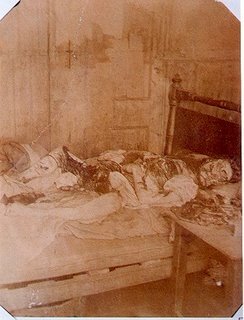 The name was that of Jack-the-Ripper's LAST CONFIRMED VICTIM! A chill went down my spine. Why would a rotting, mutilated corpse be calling me? I shivered. I didn't even do a reverse lookup to see where exactly in AL the call originated. I knew it HAD to be from BEYOND THE GRAVE! Was she trying to warn me of something? Was she AFTER me? I listened to the very brief mumble on the recording. I strained to make out the near-unintelligible words. Then, like an epiphany, I figured it out... it said, "It's dead." OMG, what's dead?! Over the next few moments, my mind eased off the horror tip, and I realized it was a wrong number. Apparently, my greeting didn't play, or something, and the person was led to believe the line went dead. I'm not going to post the name (although it can deduced from my post) and especially not the number, but that's not the point, anyway, is it? Yeah, I could have called the number and found out who it REALLY was, but what fun would that have been?